Click on the above picture to find out more about the Turtle Farm. You will learn how it suffered from Hurricane Michelle and what is being done to help resolve the situation. You will be able to find out uptodate information on how many turtles have been returned, and where they were found. 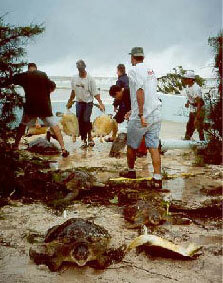 The Cayman Islands' Turtle Farm sustained damage from Hurricane Michelle in 2001. We are sad to report that a large number of breeding turtles have been swept out to sea. To help resolve this problem a programme outlined below was organised to help return the breeding turtles to the farm. You can also visit the Department of Environment's website for more information on turtles by clicking on the above turtle animation. Turtle nesting time - May - October - Nests/hatchlings are protected by law. Hatchling turtles will be dazzled by bright lights and that special turtle friendly lights can be purchased so that our turtles reach the sea and don't end up on land instead! Remember to contact Catherine/Joni at the Department of Environment for more information. We visited the Turtle Farm to find out what had happened to the turtles during hurricane Michelle. We found that the farm still had some of the large green turtles and that some of these weighed 600 lbs and were over thirty years old. It was very sad to see the devastation at the farm but we were glad to see that there were still turtles being preserved, thanks to our turtle farm. We hope that the other yellow tagged turtles will be found soon! CTF tagged breeder. The picture below shows the yellow tag. "Prior to the storm, CTF had a total of 352 breeders, of which just 77 now remain. Of these, only 59 are female, and some of these are still too young to reliably produce eggs. After a number of sightings of the lost turtles in the wild, Joe Parsons of the Turtle Farm approached the department seeking help in their recapture. The Marine Parks Law currently allows for traditional turtle fishermen to obtain licences that allow them to take six turtles yearly, within certain weight restrictions. With the agreement of seven of these fishermen, the Conservation Board has issued special licences allowing them to set nets and capture any number of these turtles, at any location around Grand Cayman, including marine parks and replenishment and environmental zones. Each fisherman will receive three specially coded tags from the DoE, which must be attached to his turtle nets at all times. Only turtles positively identified as CTF stock may be taken from these areas, and upon capturing a breeder, the fisherman must immediately notify DoE marine enforcement personnel. Once a marine officer has identified the turtle and recorded its tag number, it can then be returned to the Turtle Farm. The fisherman must also have his laminated licence with him while fishing." September 2002 - Please note that the above information for fishermen no longer applies and is only on our website for historical information purposes. Fishermen are no longer asked to help with the returning of the turtles as outlined above. Please contact the Department of Environment and the Turtle Farm for more information. Says Mr. Parsons, "It is vitally important that we recover as many breeders as possible. It has taken the farm some 32 years to build up this stock, and the loss severely impedes our ability to both replenish turtle stocks in the wild and provide fresh turtle meat. A farmed female Green Turtle does not reach reproductive maturity until about 16 years of age, so rebuilding a stock of breeding turtles would take correspondingly as long." "People often ask whether these turtles are not better off in the wild," says Department of Environment Director, Gina Ebanks-Petrie. "But what we have to understand is that if it were not for the Turtle Farm producing turtle meat for local consumption, poaching pressure on our wild populations would be much, much greater." 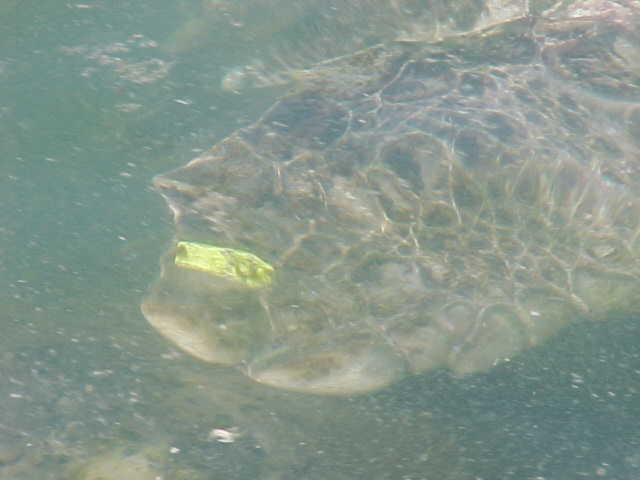 The escaped turtles are easy to identify, as both back fins are marked with bright yellow identification tags. 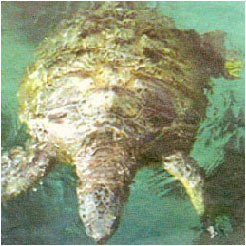 They are also extremely large, weighing anywhere from 150 to 600 pounds, with shells four to five feet in length. Please remember that if you see these tagged turtles it is important to notify the Department of Environment of their whereabouts immediately but refrain from catching the turtles as it is now forbidden by law. August 2003 - The turtle farm is currently being rebuilt and sadly many of the turtles lost during Hurricane Michelle have not been located.